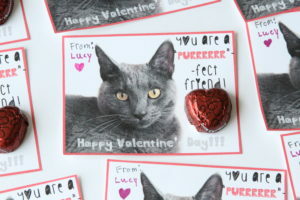 If you want to make a unique but simple Valentine with your kids, then check out this very adorable Valentine Day Cat Cards! My daughter was very much into cats last year, and all conversations and activities she was into pretty much revolved around cats. We even threw her a fun Cat Birthday Party, and it was seriously the cutest party ever! Bonding with a shy cat can be a challenge. You want to dote on your kitty and give her all your love! But instead she runs away from you and hides. It can be downright frustrating! But have no fear, there are several ways to help you bond with your shy cat. Keep reading to find out 4 helpful shy cat tips. Our cat, for example, is not the most sociable cat in the world. She sure is sweet, but she does tend to have a very timid personality. A lot of it probably has to do with her past. When we adopted her, there was very little information available about her past. We suspect that she was living on the street when her foster family rescued her. It’s no wonder she was a very cautious cat at first! It took a while for our cat to trust us and become comfortable enough be around her new humans. She has come a long way! Our little shy kitty lets us pat her and rub her belly. She comes to snuggle with us in bed or keeps us company on the couch, but this didn’t happen right way. We had to be patient and understanding that we can’t force our affections on her. Our lady cat has yet to come on our laps. And as much as I desire that, I am also very aware that it may never happen either. We will love our cat regardless! When bringing home a new cat, we tend to focus on all the wonderful cuddle time and play time we will have with him or her. 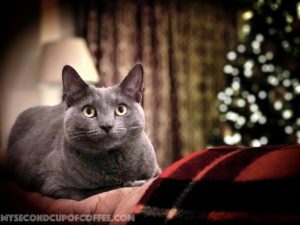 What we don’t often think about is that we need to make sure our house is actually safe for the cat! When it comes to cat safety, some things are obvious, an some things are bewildering and eye-opening. 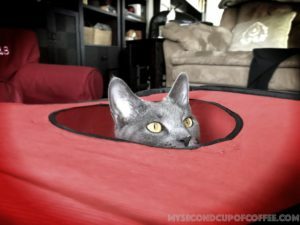 Nonetheless, in order to keep your cat safe in your home, you need to make sure your house is ready. First days with your new cat are going to be chaotic. Embrace it, it won’t last long. You simply need to prepare yourself for some adjustments. 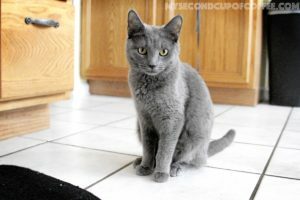 If you know what to expect, getting settled with your new cat should be a breeze! Every cat is different, so not every cat will react to his new environment the same way. 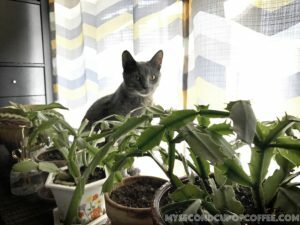 Below are some common ways that cats act when they arrive to their new house, and hopefully it’ll give you an idea of what to expect. This past week-end marked a 1 year anniversary since we had adopted our sweet cat, Koshka. As I was reflecting back on the year we’ve had with her, I realized that I can’t even imagine our house without her now. She has truly become a member of our family. Our lives have changed because of her, and I don’t mean just the extra chores and expenses. We all became a little more patient and tolerant, thoughtful and, hopefully, responsible. And she…I hope she learned to trust humans again and became even more flexible and accepting of us than she was already. We really couldn’t have asked for a better 1st cat!! You have finally made the decision to have a family pet, a CAT! When that the excitement of it wears off, it’s time to make another important decision. WHICH is the right cat for you and your family? When you start looking at all the available options, it can get overwhelming very quickly. 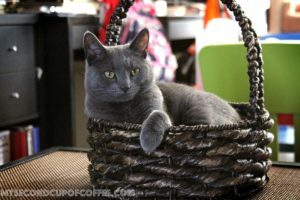 Here are a few tips to help the process of choosing the right cat for your family go smoother.